progVisions has always supported bands that make highly original music. Music made with a lot of passion, dedication and without compromising on originality. These are often bands that are not well known by the main stream Prog lover. One of those bands is the Italian band Ataraxia. If you insist to label their highly original music, I would classify it as Neo- Classical. But really you can't label a band like Ataraxia ... who earlier said about themselves ... “We define ourselves ’craftsmen of the sound’ because of the wild, unusual mix of sacred and profane, early and contemporary, neoclassic and experimental music we create.” So progVisions is crossing borders again to inform you about this wonderful world ... a world of pure beauty. Because of label changes I lost track of the discography of the band. Last month a representative of the band asked me if I was interested in reviewing the new album “Deep Blue Firmament”. I discovered then that progVisions had missed the last three Ataraxia albums. In the year 2013 the band released the “Spasms” album that was followed up by the albums “Wind At Mount Elo” (2014) and “Ena” (2015). So before the new album will be released progVisions is asking your attention for the 2015 Ataraxia album entitled “Ena”. 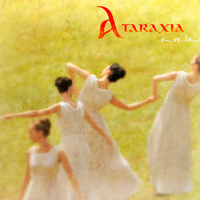 On “Ena” you can find four Ataraxia compositions and four traditional songs that have been arranged by Ataraxia. The album opens with the prayer “Ena” in which vocalist Francesca Nicoli sings the sacred words Kyrie Eleison. The angelic singing of Francesca sets the atmosphere of the album. This is followed by the traditional “Roy Richart”. If you hear this slow and beautiful track you can imagine that the band prefers to perform live at special places like churches or castles. The ending has some folk influences. “Agnus Dei” opens with atmospheric orchestrations and the voices of Francesca, Vittorio and Giovanni. The combination of electronic orchestration, acoustic instruments and the voices is very beautiful. Talking about beautiful, the next song “La´ Awiyah” is just stunning. Amazing melodies, delicate classical guitars and that angelic voice ... Pure beauty. In “Magnificat” an arranged traditional, the low voice of Giovanni gives a nice contrast with the high pitched voice of Francesca. Then we can enjoy the beauty of the song “Where The Sea Turns Into Gold”. The sea has a special place in Ataraxia's heart. Those songs have always a blissful atmosphere and are like little special gems. But to be honest this counts for the whole album. “The Bleeding Trunk” is also a piece of pure beauty. The instrumentation on this album is so delicate and pure. The last track “Le Nozze Di Yis” is a worthy ending of an album that is in balance and that radiate the atmosphere of purity, beauty and love ... Pure bliss.